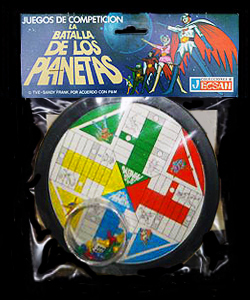 The Spanish board game was based on the standard "Battleship" game, it came with two foldable playing surfaces and a selection of plastic pegs to indicate hits and misses. Year unknown, by Dalmau Carles. 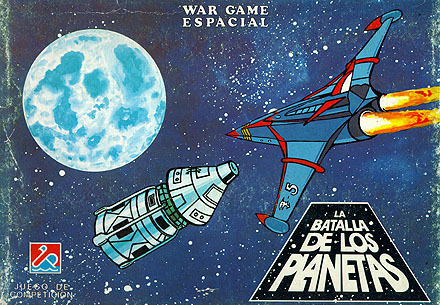 Three "Competition Games" from Spain. Each was bagged with a game surface, playing pieces, a die and rules. 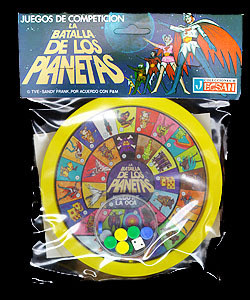 The games were issued with different colored outer rings in blue, green, red, yellow and black. Year unknown by Colecciones Jecsan. These playing cards were set up to play a number of different children's games. 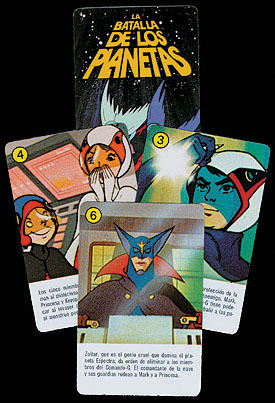 There were thirty-two cards in all (divided into four differently colored "suits"), each containing a photo from a Battle of the Planets episode, along with a brief description of the action being depicted. 1980, by Heraclio Fournier. 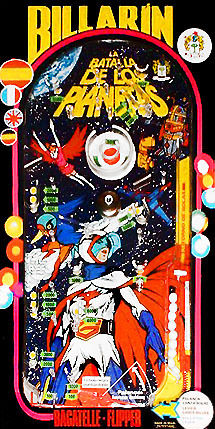 An oversized pinball game from Spain. 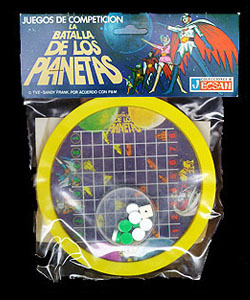 1980, by Juguetes Pique. These videogames were produced for Amstrad computer systems (left) and Sinclair's ZX Spectrum sytems (right). They were Spanish re-releases of the UK original. 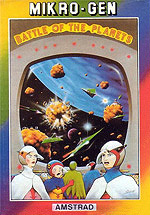 They were one of the last licensed products from the series' original line of merchandise.1986, by Mikro-Gen / Erbe Software.